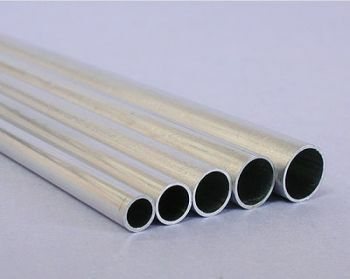 We stock the popular sizes of K&S Aluminum Tubing used for Rc Boating. Sold in single, 12" (approx 305mm) lengths. Sizes are listed in outside diameter (od). This can be used for in a water cooling system when used with silicon tubing. pn#8102 1/8" x .014 x 12"
pn#8103 5/32" x .014 x 12"
pn#8104 3/16" x .014 x 12"
pn#8105 7/32" x .014 x 12"
pn#8106 1/4" x .014 x 12"
pn#8107 9/32" x .014 x 12"
Note: Picture 2 & 3 for reference only. One tube per package. 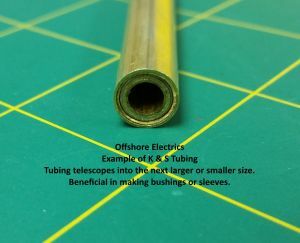 Tubing will telescope into the next larger or smaller size. 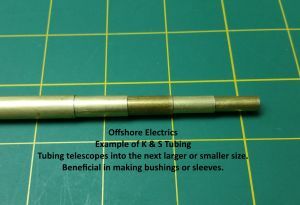 This is useful for making bushings, sleeves or drive shafts. See picture 2 & 3. Loctite sleeve retainer glue recommended for gluing brass tubing together.